optimize sales performance & customer outreach strategies. Optimize your pipeline performance with Kreato’s out-of-box sales reports provided on various key metrics such as pipeline conversion rate, average time taken for conversion, stage-to-stage progress rate. Also easily spot the attributes that leads to pipeline success via pipeline success factors reports. Optimize your email outreach techniques with Kreato’s out-of-box reports provided on various key metrics such as email open rate, time taken to response & email intent. Further to this You could quickly check for the frequency of specific terms including your competitor names or your product features spotted on customer emails. Optimize your call outreach techniques with Kreato’s out-of-box reports provided on various key metrics such as call connection rate, call frequency, time spent & call intent. Further to this quickly check for the frequency of specific terms including your competitor names or your product features spotted on customer interactions. Get comprehensive view on sales rep today’s activities to measure the productivity at the end of the day. 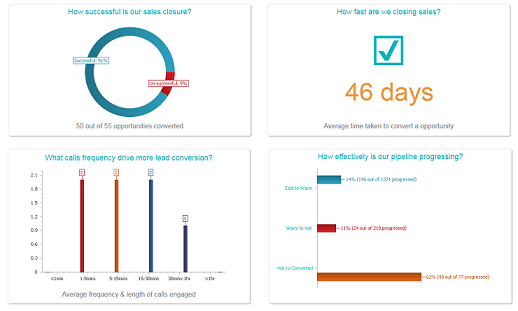 Get facts on the pipeline achievements (such as leads conversion, deals closure), customer engagements (such as number of emails sent, sales calls made and in person visits engaged) and tasks executed. Pre-Built dashboards and reports available on lead, sales pipeline and accounts with details on sources, current stages, active/deferred status, win/loss parameters, loss/disqualification reasons and ownership factors. Also Kreato provides scope to create custom dashboards with necessary parameters specific to the analytics needed. 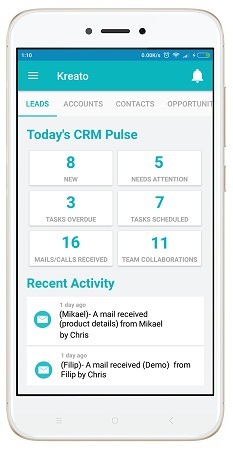 Get instant view on what’s happening currently on the CRM activities. Visualize the inflow trends of leads/deals, recently engaged customers, recently generated leads/deals and get quick links to the tasks that need to be attended and pipeline that needs attention.